One of the most widely known animal rights groups is no stranger to using emotional appeal to win over people's minds. We've seen them all when we view websites, videos or photos posted by anti-agriculture groups. The furry kittens, bouncing puppies and wide-eyed bunnies have made us all go "awwww" at some point or another. Let's be honest: animal rights propaganda is good at making people feel all sorts of emotions. Take, for example, this video called "Down on the Farm." It features a song and a plucky guitar to give the video a homespun feel during its 1-minute, 17-second duration. Scene One: the video starts off with a cow, a pig and a chicken living what would appear to be happy, uninterrupted lives. "The cow on the farm goes moo, the pig on the farm goes oink, the chicken on the farm goes bawk, bawk, bawk . . . down on the farm," the narrator sings. Scene Two: Things take a sinister turn as soon as the animals are moved inside, which (again) portrays confinement housing as bad. The cow is force-fed, the pig is squeezed into a crate and the chickens are little more than egg-laying machines. 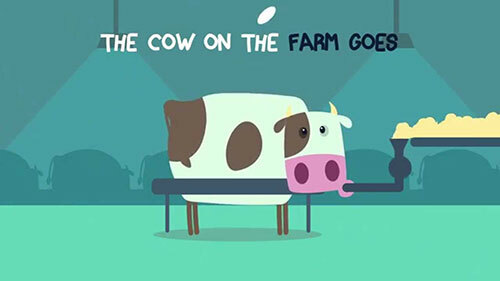 "The cow on the farm goes moo," as the cow gets fatter. "The pig on the farm goes oink," when the pig nearly bursts out of the crate. "The chicken on the farm goes plop, plop, plop," as eggs fall like rain onto a conveyor. Scene Three: The cow looks green, as if she is nauseous. We all know cows can't vomit, but the general public might not. Her tail has also been docked. The fatigued pig has been reduced to little more than a piglet-producing apparatus, and the chickens are now being decapitated with a buzz saw. "The cow on the farm goes beep," she sings as the cow is hooked up to a milking unit/life support machine. "The pig on the farm goes sigh." "The chicken on the farm goes – "
Scene Four: A T-bone steak, some bacon and chicken legs are rolling down the checkout line at the grocery store. "The cow on the farm goes beep, the pig on the farm goes beep, the chicken on the farm goes beep, beep, beep . . . down on the farm." Animal rights groups have long been able to sway people by yanking at their heartstrings. We have logic and truth on our side, but that doesn't resonate with people like warm fuzzies, no matter how untruthful or ridiculous PETA's claims may be. We may be right, but we're losing the battle because of cartoons like this. As an industry, we need to learn to not just connect with our customers' minds, but their hearts, too. Reach out to your nonfarm friends on social media outlets. Don't be afraid to let people in on day-to-day activities on the farm so they can see the hurdles you have to clear in order to bring wholesome and nutritious food to their tables. Post a picture of a silly calf on Instagram, or introduce your Facebook friends to your favorite cow through a funny and well-written post. Show them how much you care. Make them laugh, make them smile, make them go "awww" . . . most of all, make them feel what you feel when going about your business on the farm, including the highs and lows. After all, people may forget what you did and what you said, but they will never forget how you made them feel. The author is a senior at the University of Wisconsin-River Falls, majoring in agricultural marketing communications. She is the 27th Hoard's Dairyman editorial summer intern.